Will Russia's Heat Wave End Its Global-Warming Doubts? Russia Welcomes Home Its Spies  So What Now? Russians are not used to heat waves. When the high temperatures that have overwhelmed Russia over the past six weeks first arrived in June, some 1,200 Russians drowned at the country's beaches. "The majority of those who drowned were drunk," the Emergencies Ministry concluded in mid-July, citing the Russian habit of taking vodka to cool off by the sea. But while overconsumption of vodka is a familiar scourge in Russia, extreme heat is not, and as the worst heat wave on record spawns wildfires that are destroying entire villages, Russian officials have made what for them is a startling admission: global warming is very real. But even that pronouncement, grim as it seemed to the organizers of the Copenhagen talks, was mild compared with the broader Russian campaign against the idea that global warming is taking place. Two months before Copenhagen, state-owned Channel One television aired a documentary called The History of a Deception: Global Warming, which argued that the notion of man-made climate change was the result of an international media conspiracy. A month later, hackers sparked the so-called Climategate scandal by stealing e-mails from European climate researchers. The hacked e-mails, which were then used to support the arguments of global-warming skeptics, appeared to have been distributed through a server in the Siberian oil town of Tomsk, raising suspicion among some environmental activists of Russia's involvement in the leak. "Broadly speaking, the Russian position has always been that climate change is an invention of the West to try to bring Russia to its knees," says Vladimir Chuprov, director of the Greenpeace energy department in Moscow. Case in point: when Medvedev visited Tomsk last winter, he called the global-warming debate "some kind of tricky campaign made up by some commercial structures to promote their business projects." That was two months after the Copenhagen talks. But Medvedev's climate-sensitive comments on Friday, Chuprov says, could finally mark the start of a policy shift. "You don't just throw comments like that around when you are the leader of the nation, and if you look at what is happening with this heat wave, it's horrible. It's clearly enough to shake people out of their delusions about global warming." The heat wave first started alarming authorities in June, when local officials recorded abnormally high fatalities on Russia's beaches. At the same time, a devastating drought was withering Russia's crops. As of July 30, some 25 million acres (about 10 million hectares) of grain had been lost, an area roughly the size of Kentucky  and growing. Then last week, fires that had been ignored for days by local officials began spreading out of control. By Aug. 2, they had scorched more than 300,000 acres (121,000 hectares) and destroyed 1,500 homes in more than a dozen regions, some of which declared a state of emergency. Scores of people have been killed in the fires, and in the outskirts of Moscow, burning fields of peat, a kind of fuel made of decayed vegetation, periodically covered the city in a cloud of noxious smoke, making it painful to breathe in parts of the Russian capital. 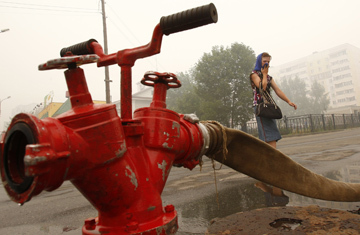 Medvedev has not been the only person in Russia to link the ongoing heat wave to climate change. Alexei Lyakhov, head of Moscow's meteorological center, tells TIME it is "clearly part of a global phenomenon" that is hitting Russia. "We have to start taking systemic measures of adaptation. It's obvious now. Just like human beings at one point took steps to adapt to the Ice Age, we now have to adapt to this," he says, citing cuts to carbon emissions as one of the necessary adaptations. Now that Medvedev is also acknowledging the effects of climate change, Russia's official line on the subject could start to change, Chuprov says. But he warns that convincing the public of the threat from global warming may be difficult. "The status quo can change quickly in the minds of bureaucrats if the leadership gives the signal. But in the minds of the people, myths are much more difficult to uproot," he says. As if to prove the point, Russia's largest circulation newspaper, Komsomolskaya Pravda, ran a headline on July 31 that asked, "Is the Russian heat wave the result of the USA testing its climate weapon?" The daily's answer was "Yes, probably." But if Medvedev stands by his pronouncements, there may turn out to be a bright side to Russia's devastating weather: one of the nations most responsible for driving climate change may finally start trying to do something about it.